The Chevy line was restyled again in 1959. Still heavily encrusted with exclusive trim and special badges, the upscale Impala now was offered in four forms: a two-door coupe and convertible, four-door sedan and four-door hardtop. Impala trim also appeared on 1959's Nomad four-door station wagon. All Chevrolet engines, six-cylinder or V-8, were available, and this same basic lineup repeated for 1960 when yet another restyle emerged. The horizontal “batwing” fins made famous (or infamous, depending on your perspective) in 1959 returned, but were complemented by revised taillights and a fresh facade up front. The lights in back came in two groups of three, as they had in 1958. Biscaynes and Bel Airs for 1960 once more featured one less pair of taillights. 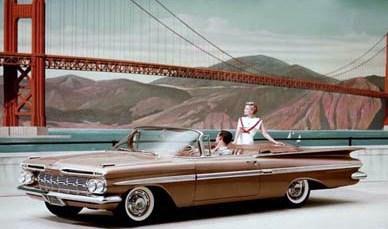 Most prized in 1959 and 1960 were the Impalas powered by the red-hot 348-cid V-8, fitted with either a single four-barrel carb or triple two-barrels.